I have a knack for finding the most amazing things on clearance. 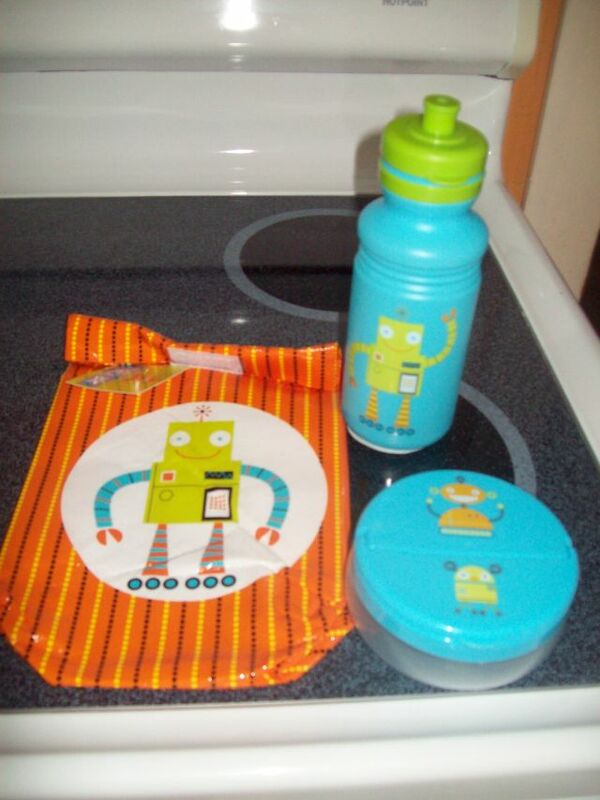 Today, I was minding my own business at Wal-mart, and came upon this cute little Robot stuff--a recyclable lunch bag, drink bottle, and snack holder--for .10/each! I would imagine that most people would see these and think oh, cool! Cheap ___fill in the blank___. I'll get one for my kid. But I am not most people. I see this and think "Holy crap! 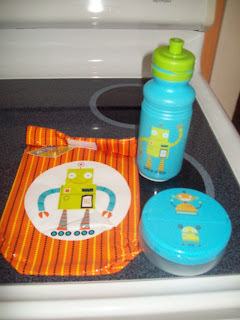 John can have a robot-themed birthday party and these can be his oh-so-cool and practical favors! For .30/kid, I am going to stock up!" And then I bought 15 of each. They also had the cutest banana split and cupcake-themed bags, too, and I almost got them, my thinking being that I could do an ice cream social birthday party at some point. But while I love a great deal, I didn't think my boys were at an age where they'd be able to live down girly looking party favors (and being bright pink, they were exceeding girly), so I passed on those, came home, and called one of my friends with a daughter and told her about them. I'm going to go celebrate my great find! Have any of you come upon a can't-live-without-it sale recently? Let's celebrate a successful shopping trip together!